War Memorial Gymnasium is located near the red arrow on the map below. You can plot a second location below. 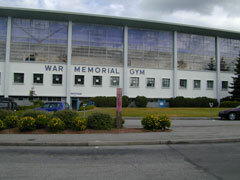 Finding Your Way: The War Memorial Gymnasium is located on the north side of University Boulevard behind the new residential mixed-use building named "Central", and on the south side of the new Translink Bus Exchange. Detailed Directions: A road map and detailed directions for War Memorial Gymnasium can be found on Google. Use the search function below to find and highlight a second location with an orange arrow on the map above (the red arrow will indicate the first location, War Memorial Gymnasium).